The ongoing economic downturn and the inauguration of a new president this month have led many commentators to hearken back to FDR and the New Deal. But in New York City, public works projects during times of uncertainty have a much longer history. One of the first times the city made a major effort to employ its citizens came in response to the “Ograbme” protests that happened 201 years ago this week. A little background: Beginning in 1807, Thomas Jefferson’s administration began instituting a series of laws known as the Embargo Acts that aimed to punish the British for the impressment of American sailors and, later, to keep American merchants from trading with Great Britain and France. The worst Embargo Act went into effect December 22, 1807, and all ships in New York harbor headed to any foreign port were forbidden from leaving. (Most snuck out before the ban could be imposed.) The effect in New York was devastating. Just as the city was growing into America’s most flourishing port, it was banned from trading with its biggest partners. Those sailors whose ships couldn’t leave port began growing restless and sowing seeds of rebellion. All the people whose lives relied on shipping—from stevedores to countinghouse clerks to the city’s wealthiest merchants—began feeling the economic pinch immediately. 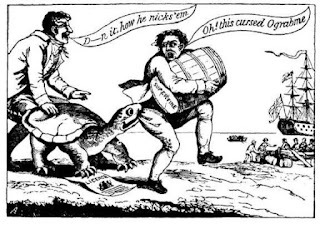 In political cartoons, a snapping turtle named O-grab-me (embargo spelled backwards) quickly came to symbolize the government’s position. And, as one astute observer pointed out, another anagram for embargo was “Mob Rage.”Indeed, on January 9, 1808, the people took to the streets of New York demanding the city do something. 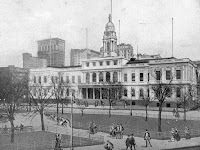 Hastily, the city complied and the civic projects that resulted had a lasting impact on the face of New York. Some people were assigned to help with the building of City Hall; others were sent to begin the draining and filling of the Collect Pond. Mayor DeWitt Clinton, fearing that the Embargo Act would inevitably lead to war, had some workers assigned to build new fortifications in the harbor to protect against a British invasion. All of these public works projects still stand. City Hall, finished in 1811, continues as the seat of city government and is the oldest such building still in use as a city hall in the United States. Of the many fortifications built for what would ultimately be the War of 1812, the easiest to see is Castle Clinton in Battery Park (where tickets are sold for the Statue of Liberty and Ellis Island). And the cleared and filled Collect Pond (which will be the subject of a future post), now sits beneath Foley Square, amidst the city’s courthouses. The history of Castle Clinton, City Hall, and more about DeWitt Clinton’s impact on the city can all be found in Inside the Apple. Pre-order it from our website today!